Expressing concern over failure of the Madhya Pradesh government to work out any schemes for the deadly silicosis victims of the state, senior activist Jagdish Patel, who is director, Peoples Training And Research Centre, Vadodara, and has been fighting for the silicosis victims of the Khambhat region of Gujarat for quite some time, has written a strongly-worded letter protest letter to Shivraj Singh Chouhan, Madhya Pradesh chief minister. Wondering the veracity of the CM's claims through advertisements in dailies which say that he has transformed the state from Bimaru to a developed state, Patel says, "We strongly feel that development without social justice to the working class people is development with destruction”. The letter says, "I hope you know about longest word in English language -- Pneumonoultramicroscopicsilicovolcano coniosis. Several workers in Madhya Pradesh not only suffer but meet painful and untimely death due to this disease, silicosis (as popularly known). Silicosis is a fatal lung disease and oldest known occupational disease. Several industrialized countries have eliminated the disease and many have controlled it to a great extent. But, though we claim ourselves to be a strong nation now, we even do not have rough estimates of the people suffering from or dyeing of Silicosis. From tribal in Jhabua to slate pencil workers in Mandsaur to miners in Panna, hundreds of workers in Madhya Pradesh suffer from the disease." The letter further says, The National Human Rights Commission took extra pain to prepare a special report on silicosis and submitted to Parliament.The Government of Rajasthan provided budgetary allocation for the disease in its annual budget and paid Rs 3 lakh to the widows of silicosis victims as recommended by the NHRC. The NHRC also recommended to your Government to pay similar compensation in case of confirmed cases of death due to silicosis and relief & rehabilitation for the patients of silicosis." 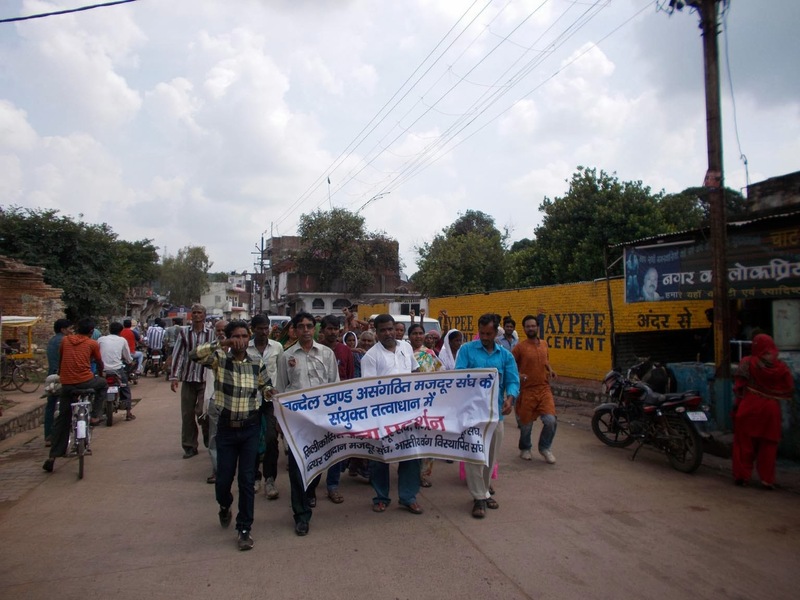 Pointing out that "incidence of large number of Silicosis victims among sand stone quarry workers in Panna district has been confirmed even by the your Legislative Assembly", the letter says, "This disease is incurable and despite this there are no diagnostic or rehabilitation facilities in the district hospital. There are no beneficial schemes in the state, except that for Mandsaur, which can provide these victims and their families with much needed support and livelihood." The letter further says, "There have been two medical camps organized by civil society, in the last two years in Panna in which 121 workers have been identified as suffering from Silicosis and out of these 6 have already died. No compensation or monetary relief of any kind has been provided by the State government yet to these workers despite notices from the NHRC and assurances from the government officials." It adds, "On Monday, September 16, 2013 when several local groups of victims, workers, and their families tried to meet the District Collector to hand memorandum addressed to the Chief Minister, the collector refused to leave his office and meet them personally. The workers and victims waited for more than three hours to meet him but the collector did not oblige. More than 100 workers were arrested by police including about 60 women. The workers wanted to meet the collector personally to represent strongly as repeated memorandums and promises have been broken with disdain." It informs the CM, "Till date the collector has not met the agitating workers to accept their charter of demands. Their demands are: Let the State government to take notice of the pitiable condition of these workers and their families are living in and help in providing them a life of dignity and well being, compensation to the families of Silicosis Victims, proper diagnostic and medical facilities in the district hospitals, effective measures to ensure prevention, identify other victims of silicosis and undertake rehabilitative measures. These are most basic needs any progressive society would need. These are the workers who help state make progress and earn revenue. In any democratic set up, if workers are not looked after, productivity would go down." It wonders, if the Congress government in Rajasthan can hear the pain of poor why not the BJP government in Madya Pradesh? We have high hopes on your sense of social justice. We demand prompt, positive action in this regard from your end."